Discovering the Warre Hive in an issue of Permaculture Magazine forever changed the way I keep bees. In contrast to the clumsy Langstroth, it was elegant, well thought out, and designed to work with honeybees. I was hooked. Measuring 12″x12″x8″, Warre boxes are easy to lift and manipulate but their real genius is that they’re sized to the dimensions of an over-wintering cluster of bees. Sizing the hive to the bees eliminates horizontal space and makes it easier for the bees to access winter honey stores. To understand this, it’s worth pointing out that bees have a difficult moving perpendicular to the comb. In the Warre Hive design, the bees simply move upwards to access honey above them. Contrary to popular beekeeping mythology and practice, honeybees build down. To test this, look no further than a natural colony. When a swarm finds a new home the first thing it does is build comb down from the highest point. The bees continue this process as long as there they’re still finding nectar and pollen. As they extend the comb downwards, the queen and brood move with them. This provides room above the brood nest to store honey. The result is a column of expanding honey with brood at its base. In the winter, this process is reversed as bees consume their way upwards. While they build comb from top-down, they consume it bottom-up. The effect is that an over-wintering hive will cluster together and rise with the heat (consuming honey as they go). To work with this natural behaviour, Warres Hives are typically added to from the bottom (a process called nadiring). A Warre beekeeper starts with one box then adds another to the bottom once the first is almost full. This process continues until the honey flow slows down in the fall. Besides working with the bees natural behaviour, this process removes the need for a queen excluder. Just add empty boxes to the bottom of the hive and harvest full boxes of honey from the top. It’s a never ending tree-trunk conveyer belt of honey. 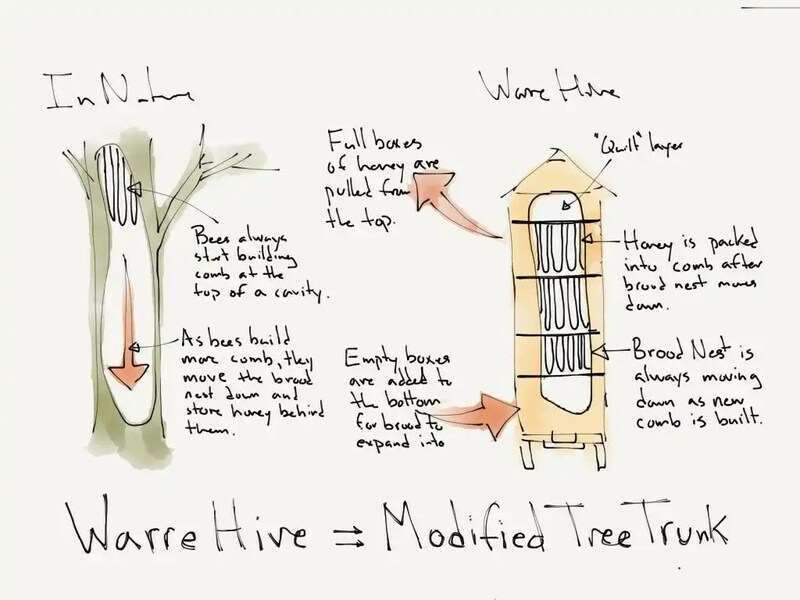 A Warre Hive is a modified tree truck. A Beecentric Hive is a modified Warre Hive. Traditional Warre Hives are foundationless. Equipped with top-bars, bees draw their own comb. Their natural preference for smaller cells decreases susceptibility to varroa mites that prefer to breed in large cell foundation. Honey is usually extracted from Warre Hives by crushing the comb and letting the honey drip through a sieve. It’s slower than using an extractor but it ensures that the oldest comb is continuously crushed and won’t become a vector for diseases. As an added bonus, fresh comb renders excellent beeswax. Warre hives are equipped with a Top-Quilt instead of an inner and outer cover. The Top-Quilt is a mesh bottom box filled with straw, woodchips, or other breathable organic matter that insulated the hive. However, the key difference between a Top-Quilt and an insulated inner cover is that the Quilt is also breathable and allows warm, moist air to escape the hive rather than condense inside the hive. A peculiar feature of the Top-Quilt is that the bees will add or remove propolis to the bottom screen to regulate the internal airflow of the hive. Of course, there are a few drawbacks of the Warre Hive. For starters, it doesn’t use standard parts. That means that you’ll have to build one from scratch or by one custom made. If you need a part in a pinch, you might have a hard time tracking one down. This isn’t a deal-breaker if you’re handy. But it is inconvenient. You can’t go to the store and buy a feeder for a Warre hive. A second and more crucial drawback that the Warre Hives uses top-bars instead of frames. Yes, top-bar hives are all the rage but they have a downside. Mainly that the bees will eventually attach their comb to the sides of the box and to the top of the top bars in the box below it. When this happens, you’ll be unable to remove individual comb, check your hive, monitor for potential problems, or make splits and nucs. A few years after keeping traditional Warre Hives, I took everything I liked about the Warre Hive and started building a modified version I’ve been calling the Beecentric Hive. Simply put, they are Warre Hives that use standard medium Langstroth frames (which I use without foundation). This design has given me all of the benefits both hives. It’s built for bees but I can also inspect each frame.